The increase of thermoelectric power factor by introducing nanowires. 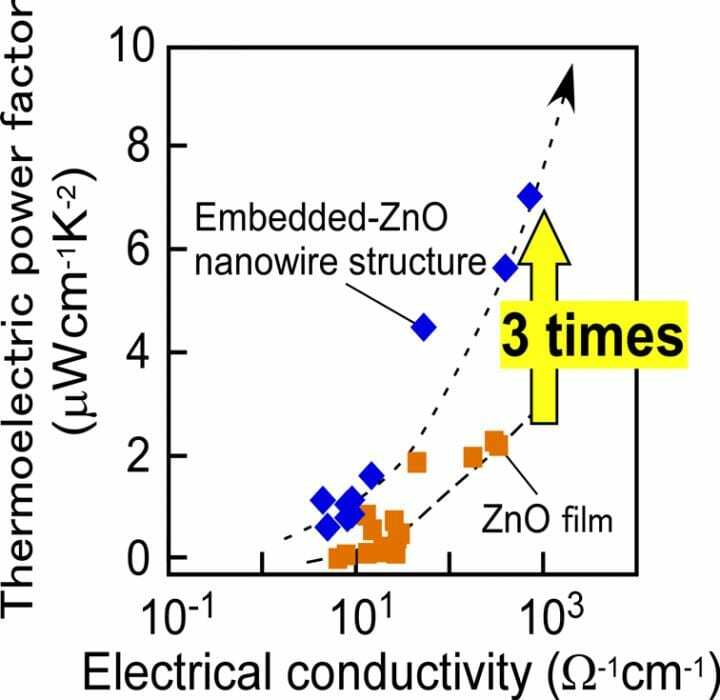 Embedded-ZnO nanowire structure exhibited a thermoelectric power factor 3 times larger than that of ZnO film without nanowires…. In the future, it will be possible to greatly decrease the thermal conductivity of Embedded-ZnO nanowire structure by increasing nanowire areal density. The thermoelectric devices composed of films with this structure are expected to be realized and see widespread use due to their use of low-cost and environmentally-friendly ZnO. Furthermore, the concept of "Modulating energy barrier height by controlling dopant concentration" can be applied not only to ZnO but also to other promising materials, which will accelerate the development of various high-performance thermoelectric materials. The results of this research were published in ACS Applied Materials & Interfaces on Wednesday, October 10th, 2018 at DOI: https://doi/org/10.1021/acsami.8b13528.